The illustration below shows the hearing aid without the ear-set. The choice of ear-set solution depends on your specific needs. Please refer to the separate ear-set user manual. This hearing aid is capable of producing a sound pressure level exceeding 132 dB SPL. There may be a risk of damaging your r­ esidual hearing. 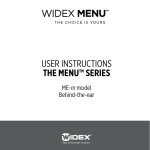 aid: “Ear-sets for Widex BTE hearing aids”. carefully before you start using the hearing aid. devices to be used in everyday listening environments. and all hearing loss configurations. are trained in hearing (re)habilitation. can be provided with a red mark. tab has been removed, the battery will start functioning after a few seconds. Do not use batteries if there is a sticky residue from the tab or other unwanted substance, as this can cause the hearing aid to malfunction. Use the nail grip to gently swing the battery drawer open. plus (+) sign on the battery faces upward. to steer the battery into place. If the battery drawer does not close easily, the battery is incorrectly inserted. the battery drains suddenly there may however be no warning. We recommend that you always have a spare battery with you. Never leave an exhausted battery in the hearing aid. Exhausted batteries may leak, damaging the hearing aid. are in traffic or are otherwise dependent on warning signals. Please remember to turn off the hearing aid when it is not in use. Remove the battery if the hearing aid will not be used for several days. upwards with the opposite hand. tube rest comfortably on the ear, close to your head. 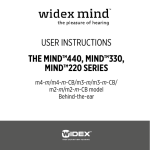 separate ear-set user manual provided. If the ear-set does not fit or sit properly, causing discomfort, irritation, redness or the like, contact your hearing care professional. Remove the hearing aid from its position behind the ear. lower part of the tube. control, shaped like a small lever. Push the lever downwards to gradually lower the volume. reached, a steady tone will sound. reproduced sounds are distorted, or if you would like any further information, consult your hearing care professional. In this program you listen via the hearing aid microphones (M) and the telecoil (T). If your needs change over time, the combination of listening programs can be altered. To change programs, use the program switch. to a slightly different position. 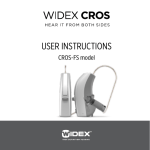 “Ear-sets for Widex BTE hearing aids”. and allow it to dry. external audio equipment (radio, TV, etc.). For more information on the use of audio input consult your hearing care professional. 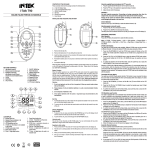 60950-1, IEC 60601-1 or equivalent safety standards. and a receiver clicked onto the hearing aid via an FM shoe. The system can be set according to your needs. control or other accessories, please consult your hearing care professional. the hearing aid will not be used for several days. changes while holding the hearing aid above a soft surface. contact with sticky or greasy substances, such as hair spray or sunscreen. even ­fatalities. In case of ingestion, contact a physician immediately. supply. Discard used batteries carefully. as you may risk swallowing it. • Clean and inspect your hearing aid after use to check that it is intact. recharged. Dispose of used batteries according to the instructions. • Never allow others to wear your hearing aid, as this could cause permanent damage to their hear­ing. surrounding sounds (e.g. traffic, warning signals). you should seek medical attention and contact your hearing care professional for advice on how to disinfect the various hearing aid parts. Do not under any circumstances use alcohol, chlorine or similar substances for this purpose. • Regular use of a de-humidifier is recommended to help avoid malfunction of the hearing aid. damage the hearing aid, but may create audible interference. from other products such as alarm systems, room surveillance equipment and mobile phones. other equipment, such as medical devices. • Never try to open or repair the hearing aid yourself. can take time to get used to a new hearing aid and new sounds. to gain full benefit from it. • The use of hearing aids increases the risk of accumulation of earwax. the environment when waste electrical and electronic equipment (WEEE) is not handled correctly. Do not dispose of hearing aids, hearing aid accessories and batteries with ordinary household waste. the date of manufacture may also be stated . the date when the product was manufactured . the date after which the product is not to be used . the product’s batch code (lot or batch identification) . the product’s catalogue (item) number . can be safely exposed . before using the product . designated collection point for recycling and recovery . in european ce marking directives . use in some ce member states . Australian or new Zealand market . Fully assembled, ready-to-use wallmount cabinets.